Sunnyside is truly the church that never sleeps. There seems to never be a day or night without something going on at the church. Isn’t that the way it should be? It has been sometimes said that the most unused buildings in a community are churches. Well, no one can say that about Sunnyside. I do believe that the high use of our building is an honor to those past and present who sacrificed to bring about the vision of Sunnyside. 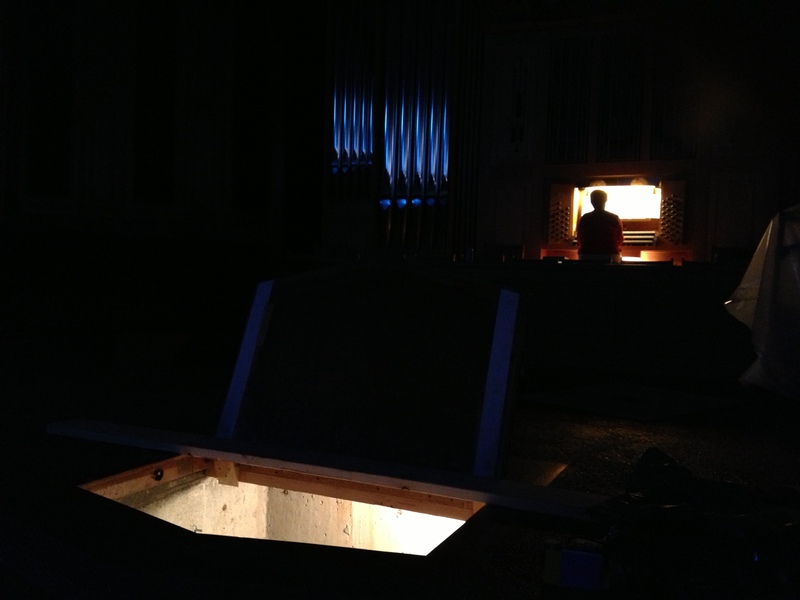 This week saw the ground breaking of the installation of our new sound/projection system. It is a good thing for the boxes of components keep arriving. Just recently removed was the pulpit that was located under the rostrum; that was the one that could electronically rise and lower from the floor. Pastor Jonathan has posted a Facebook picture of its being removed. Never seen it? Don’t feel bad, neither had I. What impressed me about it was how big it is. It seems times changed over the years at Sunnyside and the use of an authoritative, massive pulpit was no longer seen as conducive to the feel people wanted between the pew and the speaker. Anyway, the area under the platform where this was removed will be “nerve central” for much of the new electronic equipment. Having said this, watch for a list to be published of what type of assistance we will need and when. At times we will need people who can help push tubing, other times pull wire, woodwork, assembly of components, and many times we will need people who can come in Friday afternoon and help clean up for the upcoming Sabbath. Church Board on Wednesday night was more a night of ministry reports. What is interesting is that there are not only many ministry projects sponsored by Sunnyside, but many of the members perform countless hours behind the scenes helping people, doing things around the church, etc., all unknown by most of the rest of us. Why do they do it? Because the Lord laid it on their heart! Thank you! This weekend is a great one for us as our community series, “How to Teach Your Kids About…Life” comes home to Sabbath morning. Pastor Jonathan will be continuing the series with “How to Teach Your Kids About…God’s Gifts.” It seems that as busy as life is, we too often fail to realize the gifts that pour out from the throne of heaven. Yet hundreds of times, the Scriptures tell of the good gifts of God. Tomorrow will be a celebration of those gifts, and a challenge for us to grow in using some of the gifts that God gives. Because the series moves to Saturday morning, you no doubt will see extra people whom you don’t recognize. Don’t be afraid to introduce yourself and get to know someone you haven’t yet met. Maybe the person you meet will be a long-time Sunnysider. Maybe they will be a first-time guest. Either way, Sunnyside becomes a more connected church as we intentionally connect with each other. The series continues Saturday night with dinner at 5:30 PM and “How to Teach Your Kids About…Forgiveness” at 6:15. If you have not yet brought your family to this event, it’s worth coming out this weekend. The food has been fantastic, the kids have been having WAY too much fun, and the conversation has been though-provoking. It’s not too late to join in. Thanks to each of you for your part in making Sunnyside a great place to worship, connect, and serve. May the Lord bless us as we experience His Sabbath together.